'Love hurts' was written by Boudleaux Bryant and Felice Bryant and first recorded by the Everly Brothers in July 1960. The song was covered by Roy Orbison in 1961 and issued as the B-side of his single 'Running scared'. 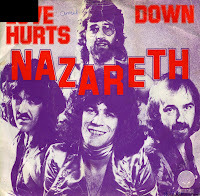 Nazareth recorded their version of 'Love hurts' in 1974. They changed one line in the lyric, from 'Love is like a stove / It burns you when it's hot' to 'Love is like a flame / It burns you when it's hot'. Their version reached number 8 in the US Billboard Hot 100, number 15 in the UK singles chart and number 1 in Canada, Norway and the Netherlands. It remains the best-known recording of the song.